“You might be disappointed” was the assessment of a fellow traveller. “I haven’t been there in years and I doubt it will live up to its reputation”, she said. I was lucky. I am rarely disappointed when travelling. I can always find something, or even the lack of things, to recommend a place. It would at the very least be INTERESTING, I thought. Also, I had few expectations. I had barely been to Africa before, (only Morocco) let alone the Island of Zanzibar, a place that conjures the very essence of foreign and exotic. What did I have to loose? 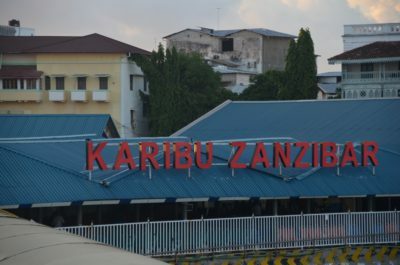 I could almost smell the heady aromas of cinnamon, cloves, peppercorn and nutmeg as the ferry from Dar es Salaam pulled into a small harbor on the island of Unguja. The capital, Zanzibar city and its ancient heart rather curiously named “Stone Town” lay spread out ahead of me. Negative expectations spawned delightful discovery; this was my kind of town. First the downside. “Stone Town” is aptly named. It has a leaden heart. As a center of the slave trade in the 18th century, there is a heaviness to the place that is hard not to notice. “Take the Slave tour,” signs suggest. “Oh god, I’d rather wound myself with a blunt instrument,” I think to myself. Must be like taking the holocaust tour in Auschwitz I surmised. A brief investigation of the slave trade buildings had me reeling. Choking back tears and feeling sick to my stomach I decided to avoid the dark heart and focus instead on the many seductive qualities of this alluring town. Given its name and heavy history, I found the place strangely flirtatious, like an aging paramour all puffed up with fragrance and rouge. The architecture was sublime: crumbling, but undeniably beautiful. 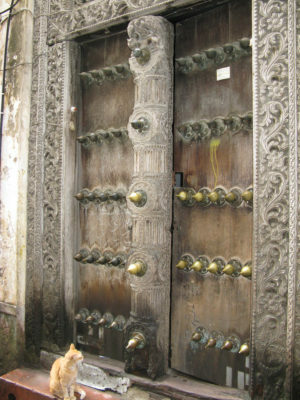 Huge, intricately carved and adorned wooden doors stand out as the dominant architectural element. Those with rounded tops are Indian; those with rectangular tips denote Omani (Arab) origins. The heavy stone building blocks are in fact coral (coralline ragstone), a friable building material at best but they give the town a lovely pinkish hue. The heavy stone blocks are softened by exquisitely playful balustrades carved out of Mangrove wood that add a touch of merriment to the otherwise stolid architecture. The history of the place is no less fascinating. Vast wealth generated from the slave trade resulted in a “belle époque”, a time when grand and exceptional buildings were constructed that remain to this day. 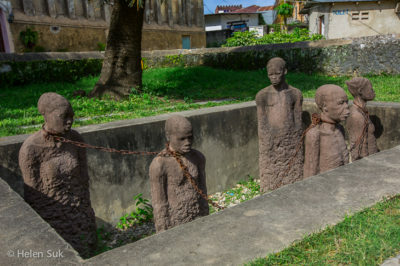 While the slave trade was a dominant industry, Stone town also played a prevailing role in abolitionism and opponents of the Slave trade conducted their ultimately successful campaigns from there. As a trading town that drew people from all over the world the town is a fascinating blend of disparate elements – African, Arab, Indian and European – and, after a millennium of cultural fusion it remains unique and special. 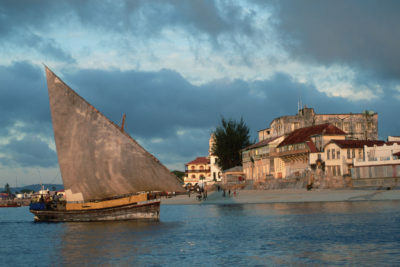 Stone Town is a UNESCO designated heritage site. The glory of its architecture has been recognized by the Aga Kahn Foundation, which is committed to the restoration of its crumbling edifices. I hope they have a gentle hand. The Japanese have a name for “fleeting moments of faded beauty” fejingu-bi no isshun – an ephemeral moment of perfection. This came to mind as I explored Stone Town. Too much gentrification will ruin the place I thought to myself. Its charm lies in its faded beauty, the soft, subtle patina of age. It helped to have “great bones” to begin with, but like mature women, good wine and figs; lovely old Stone Town is ripe and delicious. Garbage is another issue. Stone Town could use a scrub. Apparently, the new enlightened government of Dr. Ali Mohamed Shein is making clean-up an Island-wide priority. Bravo! Sadly, I did not have long enough in this unique and special place, insufficient time to fully explore the underbelly of the medina like maze of narrow winding streets, to sup from the melting pot of Portuguese, Omani, Indian, colonial English and of course African flavors that define this town. The moment I left I longed to return. 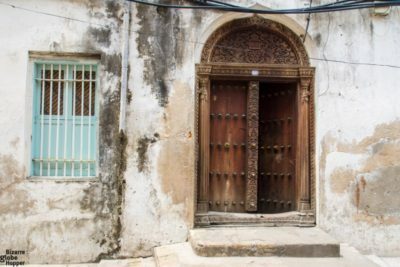 Dear Stone Town, I hope when I see you next you are as, if not even more beautiful and that you love me just as much as I love you.